Enhancing your smile’s appearance can lead to increased self-confidence and even improved social skills. Modern cosmetic dentistry combines time tested dental techniques with new and exciting technological advances in dentistry. If you are in Stephenville or the surrounding areas and looking to enhance your smile, contact our office for a free consultation to see what procedure is right for you! We have many state-of-the-art cosmetic dentistry services to give you the smile you’ve always dreamed of. Stained teeth that have dulled or even yellowed over time. Custom trays are filled with a whitening gel and can be worn for as little as an hour a day. This process can erase most stains from coffee drinking, eating acidic foods, and even tobacco usage. It can also restore teeth that have yellowed with aging. This procedure can be complete in as short as a week and produce a brilliant, bright white smile. We also provide an in-office, gel treatment that provides a faster result with similar results. Teeth whitening may not be an appropriate treatment for all stains, though. For stains that are hard to treat, veneers or crowns might be a better option. Teeth that are chipped, discolored, uneven, or widely spaced might benefit from this treatment. Bonding with composite resin will solve the issued previously listed. The resin used in the bonding procedure is a natural, tooth-colored material that is applied directly on the tooth and colored the exact way the patient desires. When exposed to an ultraviolet light, the light sensitive resin will hardens int place. Porcelain veneers and crowns might be a more viable option for certain patients if bonding is not suitable. They might be considerably more expensive in some cases. Teeth that have become chipped, uneven, stained or have large gaps. Teeth that are in his shape might require veneers to treat the issue. Customized, thin veneers are cemented directly onto the front of the tooth. Thy are very durable and will result in a natural appearance that covers up irregularities and restores the patients smile. Veneers are not the best choice for patients with tooth decay, sever gum diseases, or badly misaligned teeth. When veneers are not a suitable option for the patient, orthodontic procedures and dental crowns may need to be used. Poor dental hygiene or tooth decay that has led to a cavity (or cavities). A cavity is a small hole that has developed on the tooth and can lead to worse problems if untreated. 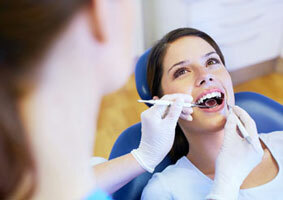 Your dentist will remove all areas of decay by drilling out the affected area. They will replace the removed area of the tooth with a filling made of silver (amalgam) or resin. Composite resin fillings have become much more popular over the years because their structural integrity is on par with amalgam fillings and they match natural tooth color. Where more extensive decay exists, inlay and onlay treatment are a great alternative for removing decay and keeping most of your natural tooth structurally intact. Tooth decay that has led to the tooth structure becoming weak. This is needed for reinforcement to restore the tooth. After the decay has been removed your dentist will take an impression of the part of the tooth that requires treatment. A dental laboratory will use this impression to create an inlay or onlay. The material that is fabricated will fit perfectly on the tooth and is typically made from porcelain, composite resin, or sometimes gold. 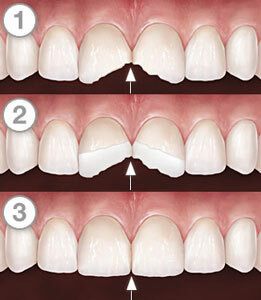 Inlays may cover one or more tooth surfaces, while onlays are used on the chewing surface of your teeth. The material is then cemented into place. It will create a very durable and long lasting dental restoration. Porcelain is usually the preferred material to use in this process as it can match your teeth’s natural look. When tooth decay becomes too advanced, inlays and onlays may be out of the question. At this point a dental implant or crown might be needed. Teeth that are damaged, severely decayed, or badly weakened might need dental crowns to restore a smile. Crowns do a great job maintain the aesthetics and general appearance of a tooth extremely similar to a natural one. They cover the entire visible surface of the tooth and add reinforcement and protection to the tooth. After removing all of the decay, the dentist will take an impression of the area that requires a crown. They will send it to a dental lab have the crown fabricated. Crowns can be made of either porcelain or gold. Porcelain crowns are natural looking and practically indistinguishable from the rest of your teeth. This makes them an ideal choice for teeth that are always visible. Gold crowns, on the other hand, have very little to no risk of chipping, and are a great choice for crowning teeth further back in your mouth. Teeth that are badly decayed and have been ignored may require extraction. Bridges or implants might be the only alternative treatments that are available at this point. Patients who are missing a tooth or several teeth may experience difficulty chewing and speaking. Dental shifts and a sunken appearance in the face might occur. Missing teeth can eventually lead to jaw problems that require expensive treatment. Fixed bridges are great for restoring your facial appearance and smile. They can also improve your biting force and eating experience that might have previously been a hassle. Bridges simply replace teeth that are missing with artificial teeth. The dentist will create a mold from the gap where a missing tooth (or teeth) once was. That mold will then be sent to a lab to create a bridge custom for the patient. Before the bridge gets inserted, the surrounding teeth will be prepared for the procedure as well. The bridge is set into place and the artificial tooth is properly cemented to the teeth next to the bridge. This will bring back the luster and function of your teeth. It will feel like you had never lost a tooth! If a resin-bonded bridge is chosen, the artificial tooth (or teeth) will be secured by a metal appliance that attaches to the back of the neighboring teeth. Dental implants are a permanent and very stable alternative to bridges. They are placed where the old tooth once was and do not rely upon surrounding teeth for support as the “root” fuses to the jaw bone. *If you are faced with a situation where one of the alternatives might fit your specific dental situation, please contact our office to schedule an appointment for a free consultation! Our staff will be able to assess your specific situation and give you professional assistance on which dental procedure best fits you.